So I fell asleep whilst* reading the section on Priestly magic in the “new” Advanced Fighting Fantasy last night. I don’t often fall asleep reading things because I’m generally aware enough of my need for sleep that I put the book down and turn out the light. But just pondering the various permutations of deities in several of the various pantheons I’ve dreamt up for fantasy worlds over the decades and how I’d implement them in AFF kept me going long after I should have stopped. Priests (at least those who spend points on Magic – I suppose it’s entirely reasonable to assume that not all priests can channel the divine power of their god) get access to four “magic” powers: three that are drawn from a common pool and one that is unique to their god. These powers are officially useable once each per day, though it’s possible (by spending Luck) to use a previously used power once more each day (but never thrice). It seems a little harsh to put that much of a limit on things – especially healing – but I also kinda like the capping. It keeps priests from going all miracle happy since they don’t have other “random” limits on their ability to do these things (i.e., no casting rolls and no Magic Point pool to manage). I still think I might tweak the rules a little bit, but that’s a topic for a different time. And I should probably run at least one game with the established rules in place before I go hotrodding the system. There are a large number of Titan-specific (Titan is the default AFF world, in case you didn’t know) deities described, each with his or her own unique power explained and the three “common” powers associated with him or her delineated. The common powers include things like healing, creation of food & water, protection from (deity-specific enemy X), smite (deity-specific enemy X), and so on. The unique powers are quite varied, with things like “detect lies for X turns” and “cause a terrible disease in a target” and “will never be attacked by (deity-specific totem animal)” and so on. There aren’t any official guidelines for creating unique powers for your own pantheon’s gods, but a little studying of the existing unique powers should make such a task fairly trivial in the end. In the meantime, let’s just say that a god of wine seems like an ideal candidate to grant his priests the ability to create food & drink, instill bravery (or perhaps hostility) in individuals, and possibly to cause a debilitating inebriation (or hangover) in foes. It’s tempting to try to shoehorn some kind of healing in there as well, but hey, there’s limits that must be respected here. *The hazards of reading a book written by a Brit is that it starts to colour your language. 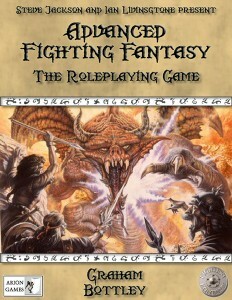 This entry was posted in Advanced Fighting Fantasy on January 6, 2012 by the venomous pao.